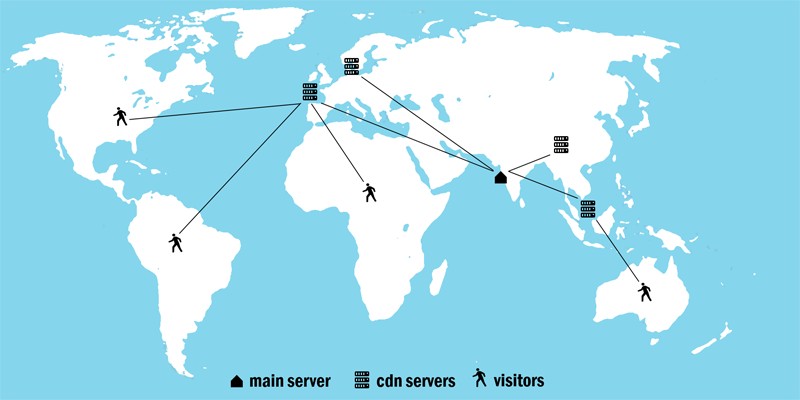 4 Comments on What is Content Delivery Network (CDN)? A Content Delivery Network (CDN) is a network of computers which caches and delivers the web contents over different geographical locations. CDN is a means through which websites can more efficiently deliver web content to their visitors through an intricate web of servers that handle cache duties. CDN stands for Content Delivery Network but someone is not wrong in calling them distribution networks simply because that does a good job of summing up their role. In CDN, not only one server used to handle the world’s traffic but different cache servers are also used to serve the content. Such cache servers located all around the world and every cache server handle its surrounding country’s traffic. Use of CDN results in a shorter latency of the connection between the origin server and visitor’s computer. Let’s say if you are using a content delivery network for your website; where your main server is in India and your CDN services allows you cache servers at Singapore, China, Amsterdam, and London. In this case, if an American user is trying to load your website so he would be connected to London server which has the lowest latency and the contents would be transferred from London. If anyone tries to reach your site from Australia so the Singapore server will serve the contents for him. See below the map to understand how the CDN works actually. A CDN service can generally reach even thousands of servers from which websites can draw data. Content that is handled by CDN providers is available as multiple copies that are located on multiple servers. These servers are obviously not located close to one another, but rather far away. This helps tremendously when website visitors request that content. So let’s say that, for example, that a visitor opens up a page which contains an image. The information pertaining to that image is drawn from the CDN server located closer to the visitor’s PC. This allows for the information to be transferred much faster than if it would be coming from the other edge of the world. By deploying the same data from the server closest to the target PC, websites are able to load a lot faster and efficiently. That means a whole static copy of the main server is available with CDN servers, so if suddenly any country started bombarding on your website for any famous content then they will not hit your main server but hit the CDN server of that location. Let’s see what could be the advantages and disadvantages of using CDN services. You can handle more numbers of traffic as it spreads the burden of the main server to all CDN servers. Visitors will able to access your site’s content faster due to lowest latency. There are SEO benefits too as the site becomes faster due to nearest available servers. You may enjoy 100% uptime because most of the CDN services work on collaboration basis; that means if one server failed to deliver your content, another server will work for that and the chain continues. Cache technology does not work on live basis but on time basis. If any content gets updated it will take some time to update the content on all CDN servers. For the current time using content delivery network would be an additional cost. There are also free CDN services too. The reason why webmasters or managers are so adamant about implementing CDN into their websites is that these services help a lot with site loading speeds and efficiency. This might seem a bit much as no one could care about website loading speed that much, right? Wrong! In this day and age, speed is a crucial asset that at times even exceeds the need for quality although that’s never recommended or preferred. People today are looking for the fastest way in which they can get what they want and if a website takes even a few instances longer to load than they are willing to wait, they will move on and look for another website with similar content. This pressures and forces website managers to use all available tools to make websites load and function as fast as possible. This is all about the content delivery network. Big companies like Facebook, Google, Twitter, and Yahoo uses this technology on a mass scale to serve the contents blazing fast. wow, I really first time heard about CDN, and found it worthy but still not understand how to use it. Let me google more about the topic as I am not sure, shared hosting will work fine or VPS would be required. I am sorry but I am not that techie girl about server administration. Any helpful response will be highly appreciable. CDN is a service; today a lot of companies like cloudflare, incapsula and maxcdn (paid) are out there who provides you the same feature. You can opt for it. The best part is it doesn’t matter how weak your server is; it will leverage all the major burden of your web server on itself. It works great on shared server, vps and on dedicated too. I know little bit about cloudflare. Let me check with my host if this is activated there or not. I agree with you, sometimes, we need fast speed for our audience but website go deadly slow :D so that’s better idea if closest server pick responsibility to it’s near about viewers. Thanks for sharing cool info bro! Nice to see that you are now considering a cdn service to optimize the overall website performance. Cloudflare is good cdn service and along with cdn services cloudflare also provides you features like website optimization and rocket loader (asynchronous content load). I hope you enjoy your time with cdn services. Good luck. Keep visiting us for more information.